"Brightline" redirects here. For other uses, see Bright line (disambiguation). Virgin Trains USA, formerly Brightline, is an express inter-city rail system in Florida, United States. The company is a subsidiary of Florida East Coast Industries (FECI), where it initially operated under the name, "All Aboard Florida." It is currently owned and operated by Fortress Investment Group, with Virgin Group providing branding rights and acting as a minority investor. Virgin Trains USA is currently the United States' only privately owned and operated intercity passenger railroad. Virgin Trains USA's service runs between Miami and West Palm Beach with a single intermediate stop at Fort Lauderdale. The Fort Lauderdale–West Palm Beach segment opened on January 13, 2018, followed by Fort Lauderdale–Miami on May 19. An extension from West Palm Beach to Orlando via Cocoa is planned to open in late 2021 or early 2022, and more extensions are planned. Virgin Trains USA's diesel–electric locomotive-hauled trains run alongside freight trains in a shared-use corridor that was upgraded from a pre-existing Florida East Coast Railway (FEC) freight train corridor. The future West Palm Beach–Cocoa segment will be constructed in a similar fashion, while 40 mi (64 km) of new track will be constructed in the State Road 528 corridor for the remainder of the extension, between Cocoa and Orlando International Airport. On September 18, 2018, Brightline announced the acquisition of XpressWest, a private company with the goal of connecting Las Vegas with Southern California via Victorville, California. Brightline announced the intent of purchasing 38 acres of land near the Las Vegas Strip for a station and following the Interstate 15 corridor from Las Vegas to Southern California with the initial journey projected for 2022. In November 2018, it was announced that Brightline would have its name changed to Virgin Trains USA, coinciding with the Virgin Rail Group taking a minority shareholding in the concession, with Fortress continuing to hold controlling interest. It was formally rebranded on April 4, 2019. In March 2012, Florida East Coast Industries (FECI) announced plans to operate a rail service between Miami and Orlando. The cost of all construction is projected at $1.5 billion. In March 2013, All Aboard Florida applied for a $1.6 billion Railroad Rehabilitation & Improvement Financing (RRIF) loan, which is administered by the Federal Railroad Administration. In late 2014, the company announced it had applied for a $1.75 billion private activity bond allocation, with proceeds from the bond sale substantially reducing or replacing entirely the amount of the RRIF loan request. The company received a Finding of No Significant Impact from the Federal Railroad Administration in January 2013, effectively clearing way for work to begin between Miami and West Palm Beach. The Draft Environmental Impact Statement for the full build-out service was released in September 2014, and a series of public comment meetings followed. The Final Environmental Impact Statement was released on August 4, 2015. As of the start of 2015, the company has started site work at the Miami, Fort Lauderdale and West Palm Beach stations, plus right of way improvements along stretches of the corridor. Service between Miami and West Palm Beach began on May 19, 2018, with service to Orlando projected to start in 2021. On November 10, 2015, All Aboard Florida announced that the service would operate under the name Brightline. Success in densely-populated southeast Florida does not mean that the planned service extension further to the north has met with universal approval. Two key Counties on the coastal route north of the West Palm Beach station have, for various reasons, been fighting the extension of the rail line through Martin and Indian River Counties in court. One of their objections is that Brightline is a private corporation, so they should not be allowed to issue tax-exempt bonds as if they were a municipality. As of Fall 2018 this legal fight has been going on for four years, during which time no progress on extending the line north of Palm Beach has been made. However in December, Federal District Judge Christopher Cooper on Christmas Eve threw out a suit by Indian River County that claimed the U.S. Department of Transportation improperly approved the bond allocation for Brightline, formerly All Aboard Florida. Dismissal of the lawsuit apparently clears the way for construction of the new rail corridor through the Treasure Coast and Space Coast. In April 2019 the company secured $1.75 billion in funding for the Orlando extension. 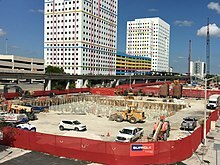 Construction began on the Miami to West Palm Beach section with the laying of new tracks and closure of the temporary surface lots in Government Center, Downtown Miami, in mid 2014. Preliminary work on the Miami station, such as site preparation and demolition, began later in the year. Suffolk Construction is the general contractor for the Miami station. Piles were being set on the four lots of MiamiCentral in early 2015. On October 29, 2014, work on the Fort Lauderdale station began with the demolition of existing buildings on the site. A groundbreaking ceremony for the West Palm Beach station was held in November 2014. Moss & Associates, of Fort Lauderdale, has been named general contractor for the West Palm Beach and Fort Lauderdale stations. In January 2015, crews started replacing track throughout the corridor. The system between Miami and West Palm Beach was projected to be operational by the first quarter of 2018, and to Orlando by late 2020. All Aboard Florida secured leasing of easement rights alongside the Beachline from the Central Florida Expressway Authority for $1.4 million in December 2015. As part of the contract, “it is understood and agreed” All Aboard Florida will be considering an extension to Jacksonville, Florida. Phase 2 of the construction between West Palm Beach and Orlando is behind the original schedule. Company officials now say construction may start in early 2019, with service to Orlando commencing in late 2021 or early 2022. The deadline for the associated bond sale has been extended to the end of 2018. The company is also seeking a federal loan to help finance phase 2 construction. On August 29, 2018, Brightline got the approval for $1.15 billion in tax-free bonds for expansion to Orlando. On December 13, 2018, Company President Patrick Goddard said during an update with the Central Florida Expressway Authority governing board that Brightline will give its contractor a 30-day notice to proceed on the $2.1 billion route on February 1. The company will then proceed with construction after those 30 days, with a goal of completing the route in 30 to 36 months. Completion of the project would be set for either fourth-quarter 2020 or first-quarter 2021. When asked about who the contractor would be, Brightline spokeswoman Ali Soule told Orlando Business Journal that more details would be revealed about the project closer to construction. Construction was scheduled to start in March 2019. and be finished by late 2021 or early 2022. Completion is now set for 2022. 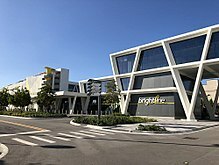 Brightline launched introductory services prior to January 7, 2018, though these runs were not open to the public. Public operations between West Palm Beach and Fort Lauderdale began Saturday, January 13. Service between West Palm Beach and Miami began on May 19, 2018. During the first six days of operation, two people were killed in separate incidents at railroad crossings along the line, after they attempted to cross the tracks while the gates were down. During the first three months of operation, four people were killed by a Brightline train when they crossed the tracks illegally, with an additional three persons injured. The 11th fatality associated with the Brightline train occurred on January 1, 2019, after a pedestrian was struck and thrown into a canal. Upon full buildout of the Miami–Orlando route, trains will operate at up to 79 mph (127 km/h) between Miami and West Palm Beach, up to 110 mph (177 km/h) between West Palm Beach and Cocoa, and up to 125 mph (201 km/h) between Cocoa and the Orlando International Airport. A future extension to Tampa from Orlando would, if constructed, also allow trains to operate at up to 125 mph (201 km/h). 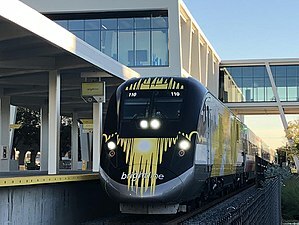 To cover the distance between Orlando and Miami in the desired time of about three hours, Brightline trains will have to operate with an overall average speed of 80 miles per hour (129 km/h), which is similar to the overall average speed of the Acela Express operating on the Northeast Corridor between New York City and Washington, D.C. By comparison, the approximate driving time for this distance is about four hours, with an average speed of 60 mph (97 km/h). The project calls for more than $1.5 billion in upgrades to the rail corridor between Miami and Cocoa. The company is double tracking the corridor, improving signaling systems, and upgrading every grade crossing to meet the highest applicable safety standards set by the Florida Department of Transportation and Federal Railroad Administration. In January 2013, the Federal Railroad Administration issued a Finding of No Significant Impact (FONSI) for the Miami–Cocoa phase of the project, effectively clearing the way for work to begin. Part of the corridor safety upgrades includes installing positive train control (PTC), which will enhance Brightline's ability to monitor and control train movements safely. Responding to citizen concerns about increased noise from additional horns, All Aboard Florida has stated that it will work with local communities to implement quiet zones where possible. Federal law requires quiet zone requests to originate from the local authority that has jurisdiction over the roadway, not the railroad company. In August 2014, the company announced a partnership with the Broward and Palm Beach Metropolitan Planning Organizations to implement quiet zones between the city of Hallandale Beach and 15th Street in West Palm Beach. In December 2014, the Miami-Dade Metropolitan Planning Organization approved funding to construct quiet zones between PortMiami and the northern Miami-Dade County line. The quiet zones were originally planned to be in place when Brightline becomes operational between Miami and West Palm Beach by the end of 2017. Brightline started service on January 11, 2018, but various delays in constructing the quiet zones have stretched their in-service date to sometime in March. On May 14, 2018, quiet zones went into effect in West Palm Beach, in Lake Worth on May 21, and in Boca Raton on May 30. The “no train horn” areas apply to freight and Brightline trains, though horns may still be used in emergency situations. The FEC rail corridor includes a number of fixed-span bridges that will be replaced as part of the project. Most do not require United States Coast Guard (USCG) permitting as they do not span significant navigable waterways and clearances will not change. Twelve other bridges—St. Johns River, Eau Gallie River, St. Sebastian River, Crane Creek, Turkey Creek, West Palm Beach Canal, Boynton Canal, Middle River (both the North and South Fork), Oleta River, Arch Creek and Hillsboro Canal—will require permitting by the USCG. In addition, the project calls for significant investment and upgrades to three moveable bridges: St. Lucie, Loxahatchee, and New River. These improvements will ensure that bridge mechanical systems for raising and lowering the bridge spans are either fully upgraded or replaced. All Aboard Florida has stated that, prior to it becoming operational, it will start to regularly notify mariners of scheduled bridge closings via the internet, smart phone application and countdown signage on the bridges to enable mariners to have real-time information to decrease wait times at each bridge. Also, the company will station a bridge tender at the New River bridge. The proposed line between Cocoa and Orlando is the only segment that does not have existing track or right-of-way owned by FEC. Originally, the Central Florida Expressway Authority (CFX) believed it could accommodate building new tracks for the project within the BeachLine Expressway's 300-foot (91 m) wide right-of-way. However, it determined that the right of way was too narrow to accommodate the tracks, additional utility lines, and any future roadway expansions. CFX began negotiations with Deseret Ranch, which owns the land just south of the BeachLine, to purchase additional land in order to widen the right-of-way. According to a pact made on July 16, 2013, CFX tentatively agreed to pay $12 million for an extra 200 ft (61 m) along the 22-mile (35 km) BeachLine corridor between Cocoa and Orlando International Airport. In early October 2013, CFX and All Aboard Florida reached a formal purchase agreement for the land required for the right-of-way. Although construction was slated to originally begin in early 2015, construction of the segment is now proposed to start in 2019. Also in October 2013, the Greater Orlando Aviation Authority (GOAA) board approved development of a station and maintenance facility on Orlando International Airport property, as well as an easement to build track between the station and the mainline to the coast. This segment of the proposed line will operate at speeds of up to 125 mph (201 km/h) and will meet the United States Code's definition of High-speed rail, which includes rail services that are "reasonably expected to reach sustained speeds of more than 125 miles per hour". The Congressional Research Service uses the term "higher" speed rail for top speeds up to 150 mph (241 km/h). 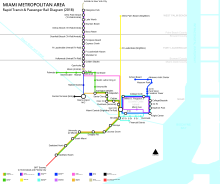 Schematic of rapid transit and passenger rail service in the Miami metropolitan area in 2017. Tri-Rail Downtown Miami Link is scheduled to be operational in 2019. Between Miami and West Palm Beach, there are 17 round trips Monday through Friday, and ten and nine on Saturdays and Sundays, respectively. During the first two and a half months of introductory service between West Palm Beach and Fort Lauderdale, ridership totaled 74,780, increasing from 17,800 in January to 32,900 in March 2018. The company itself announced that the ridership has been triple to what had been expected. The forecast provided to bond investors calls for 240,000 passengers per month by 2020 which includes service to Miami. Analyst Fitch Ratings has said that the company can break even at 56% of their ridership forecast. The three South Florida stations were designed by Skidmore, Owings & Merrill in association with Zyscovich Architects. Rockwell Group designed the interiors. All three have adjacent parking garages which offer parking at the rate of $6 per day, eff. July 1, 2018. The downtown Miami station, known as Miami (not to be confused with Miami Central Station, now known as Miami Intermodal Center, near Miami International Airport), spans nine acres located just east of Miami-Dade County Hall and includes 3 million square feet of mixed-use development with residential, office and commercial, and a retail concourse. The station connects Brightline with the Metrorail, Metromover, County bus and City of Miami trolley systems. The new Brightline station officially connects the following transit modes: 2 Metrorail stations, 2 Metromover stations, Metrobus, and the future Tri-Rail station. This increases connections to activities and tourist destinations, including the Performing Arts Center, Bayside Market and Bayfront Park. Service to Miami began on May 19, 2018. The Fort Lauderdale station is located at NW 2nd Avenue between Broward Boulevard and NW 4th Street. The four-acre station site has a 60,000 sq ft (5,574 m2) station and platform. The Brightline train service in Ft. Lauderdale connects to the Sun Trolley and Broward County Transit system. Brightline also owns about three acres of land to the east of the Florida East Coast Railway corridor, where there are plans to build a transit-oriented development. The West Palm Beach station is located between Datura and Evernia Streets and to the west of Quadrille. The two-acre station site has a 60,000 sq ft (5,574 m2) station and platform that connect with the neighborhood's existing vehicular, trolley and pedestrian networks and establish links to the Tri-Rail, Palm Tran Downtown Trolley and Amtrak West Palm Beach station. The Orlando station will be included as part of the new Orlando International Airport Intermodal Terminal at Orlando International Airport. A proposed future extension of the Orlando area's SunRail commuter rail to the airport would connect at the terminal. Before the trains enter the Orlando Airport, Virgin Trains has also established a station at Walt Disney World where construction will take 30-36 months to build. In September 2014, All Aboard Florida announced an order of five Siemens trainsets. Each Brightline train set initially consists of four passenger coaches, with a SCB-40 diesel-electric locomotive on each end. The coaches, with interiors designed by the LAB at Rockwell Group, feature ergonomic seating, Wi-Fi, level boarding, and meet ADA compliance standards. Each trainset holds 240 passengers. Working with All Aboard Florida, the LAB also conceived the Brightline name, brand platform, and visual identity. The entire trainset, including passenger cars, were manufactured by Siemens in its solar-powered plant in Florin, California. Once the route to Orlando is in operation, the trainsets will be expanded to seven coaches, and five more complete trainsets will be purchased. The first of five trainsets departed the Siemens factory on December 8, 2016, and arrived in West Palm Beach on December 14. The last trainset arrived in South Florida in October 2017. Brightline offers two classes of service: "Select" and "Smart," with one and three coaches available on each trainset, respectively. "Select" offers 2x1 and four-to-a-table seating with 50 21-inch (530 mm)-wide seats per car and complimentary snacks and beverages, while the slightly less expensive "Smart" fare coaches seat 66 with narrower 19-inch (480 mm)-wide seats, with snacks and beverages available for purchase. Each trainset is able to hold 240 passengers. Brightline has expressed interest in adding a station on Florida's Treasure Coast between West Palm Beach and Orlando. In August 2018, the company asked cities in the area to submit proposals for station locations. Fort Pierce, which last had passenger train service in the 1960s, has expressed interest. The city of Stuart has also indicated that it will be negotiating for a potential station. Brevard County (comprising the Palm Bay–Melbourne–Titusville, FL Metropolitan Statistical Area) has been lobbying for a Brightline stop as part of the expansion to Orlando, as the line will pass through the county. In 2016, the Space Coast Transportation Planning Organization selected a site on Clearlake Road in Cocoa as its proposal to Brightline. As of February 2018, Brightline had not communicated a decision on the proposal. Brightline has announced intentions to extend the line to other areas when the initial phase is complete. Jacksonville is a likely expansion destination, as the Florida East Coast Railway already owns tracks running there. In June 2018, Brightline began participation in a Request for Proposal process with the Florida Department of Transportation for the leasing of right-of-way along I-4 between Orlando and the Tampa Bay Area. Documents released preliminary to an IPO contained further details about the proposed line, including a possible stop at Walt Disney World, a fare of $35, and travel time of one hour. In November 2018, Florida DOT granted Brightline permission to negotiate with the Central Florida Expressway Authority for the leasing of the right-of-way. Brightline has also proposed connecting with the Sunrail Meadow Woods station as part of this line. On September 18, 2018, Brightline announced the acquisition of XpressWest, a private company developing a high-speed rail project connecting Las Vegas with Southern California via Victorville, California. Brightline announced its intent of purchasing 38 acres of land near the Las Vegas Strip for a station and building the line following the Interstate 15 corridor from Las Vegas to Southern California, with the entry into service projected for 2022. ^ "Cummins QSK95 achieves Tier 4 certification". Railway Gazette. April 6, 2016. ^ a b c "Brightline unveils Siemens locomotives and coaches". June 8, 2016. ^ a b "All Aboard Florida – Miami to Orlando Passenger Rail Service". Federal Railroad Authority. Retrieved February 17, 2015. ^ Spear, Kevin. "Brightline rebranded as Virgin Trains USA in new partnership". OrlandoSentinel.com. Retrieved 5 April 2019. ^ "Palm Beach Post". epaper.palmbeachpost.com. ^ a b c Powers, Scott (December 13, 2018). "Brightline expects trains to roll into Orlando as soon as 2021". Florida Politics. Retrieved December 18, 2018. ^ Branson, Richard (16 November 2018). "Introducing Virgin Trains USA". Virgin. Retrieved 16 November 2018. ^ Lynch, Ryan (April 4, 2019). "Sir Richard Branson-backed Virgin Trains USA Locks Up Funding for Orlando Leg". Orlando Business Journal. Retrieved April 4, 2019. ^ "Quiet zones plans for FEC tracks get boost, as All Aboard Florida picks up costs for some safety upgrades". Palm Beach Post. September 19, 2013. ^ "All Aboard Florida seeks federal loan". Orlando Sentinel. March 18, 2013. Retrieved March 23, 2013. ^ "All Aboard Florida shocker: Rail seeks private financing". Palm Beach Post. October 8, 2014. ^ "High-speed rail service heads south". Florida Today. Associated Press. July 9, 2014. ^ a b "All Aboard Florida – Miami to Orlando Passenger Rail Service Draft Environmental Impact Statement". Federal Railroad Administration. September 19, 2014. Retrieved February 11, 2015. ^ a b c d e f Roustan, Wayne K. (May 19, 2018). "All aboard as Brightline launches fast train service to Miami". Sun-Sentinel. Retrieved May 20, 2018. ^ a b c d Jacoby, Kenny (May 19, 2018). "Brightline's inaugural West Palm-to-Miami trip draws crowd, celebration". Retrieved May 20, 2018. ^ a b "F A Q". gobrightline.com. Retrieved June 10, 2018. ^ Hudak, Stephen (June 19, 2018). "Brightline high-speed passenger train gets Orange County OK to lay tracks in wetlands". OrlandoSentinel.com. Retrieved June 26, 2018. ^ "All Aboard Florida unveils branding of its rail service". The Real Deal Miami. November 9, 2015. Retrieved November 10, 2015. ^ "Brightline spending reaches $7.2 million in Martin, Indian River counties, but for what?". TCPalm (Treasure Coast Newspapers). Retrieved November 12, 2018. ^ "Judge tosses out Indian River County's lawsuit against All Aboard Florida". TCPalm. ^ "Florida's Brightline clears legal hurdle, gets financing extension". Bond Buyer. ^ Chardy, Alfonso (August 25, 2014). "Work begins — finally — on Miami-to-Orlando fast train". Miami Herald. Retrieved August 26, 2014. ^ Robbins, John Charles (September 27, 2016). "Brightline passenger rail service 65% built". Miami Today. Retrieved March 9, 2017. ^ Judy, Scott (July 30, 2014). "All Aboard Florida Taps Suffolk to Build Miami Station". ENR Southeast. Retrieved February 11, 2015. ^ Chardy, Alfonso (March 9, 2015). "On track: Details for downtown Miami railway hub are revealed". The Miami Herald. Retrieved March 9, 2015. ^ Turnbell, Michael (October 29, 2014). "Demolition begins for All Aboard Florida's new station". SunSentinel. Retrieved April 8, 2018. ^ Sorentrue, Jennifer (November 12, 2014). "All Aboard Florida to begin construction today on West Palm Beach station". Palm Beach Post. Retrieved February 11, 2015. ^ Turnbell, Michael (January 20, 2015). "Rail picks contractor for Fort Lauderdale, WPB stations". Sun Sentinel. Retrieved February 11, 2015. ^ Sorentrue, Jennifer (November 28, 2017). "Brightline to start limited service in December". Palm Beach Post. Retrieved December 28, 2017. ^ Sorentrue, Jennifer (July 24, 2017). "Brightline's Orlando leg delayed to 2020". myPalmBeachPost. Cox Media Group. Retrieved July 25, 2017. ^ Talley, Karen. "All Aboard Florida gains easement, hints at Jacksonville in contract". Orlando Sentinel. Retrieved April 8, 2018. ^ "Brightline wins extension to issue bonds for Orlando leg". mypalmbeachpost. May 31, 2018. Retrieved June 26, 2018. ^ Broadt, Lisa (August 29, 2018). "Brightline gets approval for $1.15 billion in tax-free bonds for expansion to Orlando". TC Palm. Retrieved September 28, 2018. ^ Spear, Kevin. "Brightline to start building rail from South Florida to Orlando in March while it rebrands as Virgin Trains". OrlandoSentinel.com. ^ "Brightline seeks additional $950 million in funding for Orlando". theledger.com. ^ "Brightline seeks additional $950 million in funding". gainsvillesun.com. ^ Sorentrue, Jennifer (January 7, 2018). "Brightline allows passengers onboard for staff training exercises". Palm Beach Post. Retrieved January 9, 2018. ^ "Happy rails to you: Brightline high-speed trains roll into action". my Palm Beach Post. January 13, 2018. Retrieved May 20, 2018. ^ "Brightline slates fares and service date". Railway Age. January 11, 2018. Retrieved May 20, 2018. ^ Broadt, Lisa (January 17, 2018). "Second person in less than a week killed by high-speed Brightline train in South Florida". USA Today. Retrieved January 18, 2018. ^ Darrah, Nicole (April 8, 2018). "New high-speed Florida train kills 4th person since launching service". Fox News. Retrieved April 8, 2018. ^ "Man's body recovered from canal after collision with Brightline train", South Florida Sun-Sentinel, January 1, 2019. ^ "South Florida gets first peek at Brightline express train". South Florida Sun-Sentinel. January 11, 2017. Retrieved February 16, 2019. ^ "Brightline-Virgin proposal for Tampa-to-Orlando rail service clears key state hurdle". Tampa Bay Times. November 28, 2018. Retrieved February 15, 2019. ^ "FECI Bringing Private Passenger Rail To Florida By 2014". Metro Jacksonville. Retrieved July 16, 2012. FECI envisions a three-hour trip between the cities at an average speed similar to the Acela between New York and Washington, DC... The initial 240-mile project between Orlando and downtown Miami is expected to cost $1 billion. ^ "ACELA High-Speed Rail Network System". Railway Technology. Retrieved May 19, 2012. The 225 mile (362km) New York Penn Station to Washington, DC takes 2 hours 48 minutes, an average of 80mph (129km/h). ^ Gale, Kevin (March 22, 2012). "Florida East Coast Industries plans Miami-to-Orlando passenger service". South Florida Business Journal. Retrieved May 18, 2012. ^ Parker, Terri (July 23, 2014). "State requires All Aboard Florida to install millions in safety upgrades". WPBF. Retrieved February 10, 2015. ^ "Private passenger train vision calls for double-tracking Florida East Coast". Trains Magazine. March 23, 2012. Retrieved March 29, 2012. (Subscription required (help)). ^ "All Aboard Florida Passenger Rail Project FONSI". Federal Railroad Administration. Retrieved February 11, 2015. ^ "Southeast Florida Passenger Rail Update: Sept. 20, 2013 Council Meeting" (PDF). Trasurer Coast Regional Planning Council. Retrieved February 11, 2015. ^ Stone, Rick (August 14, 2014). ""Quiet Zones" Along The FEC Tracks May Silence Critics As Well As Train Whistles". WLRN. Retrieved February 11, 2015. ^ "Federal Railroad Administration's Train Horn & Quiet Zone Rule". Union Pacific. Retrieved February 11, 2015. ^ Reiser, Emon (August 13, 2014). "All Aboard Florida secures funds for Broward-Palm Beach quiet zone". South Florida Business Journal. Retrieved February 11, 2015. ^ Chardy, Alfonso (January 16, 2015). "With "quiet zones' funded for Miami-Dade, All Aboard Florida moves ahead". Miami Herald. Retrieved February 11, 2015. ^ Sorentrue, Jennifer (January 11, 2018). "UPDATE: Quiet zone work to be completed in March, Brightline says". Palm Beach Post. Retrieved February 9, 2018. ^ Shatzman, Marci (May 30, 2018). "Trains to silence horns at 10 Boca Raton crossings". Sun Sentinel. Retrieved June 1, 2018. ^ Tracy, Dan (July 16, 2013). "Deal could lead to Miami-Orlando train, extended Osceola toll road". Orlando Sentinel. Retrieved July 30, 2013. ^ "All Aboard Florida secures right-of-way, station agreements". Railway Track and Structures. October 4, 2013. Retrieved October 9, 2013. ^ "49 U.S.C. 26105 – Definitions". U.S. Government Publishing Office. Retrieved April 8, 2018. ^ "The Development of High Speed Rail in the United States: Issues and Recent Events" (PDF). Congressional Research Service. Retrieved October 10, 2012. ^ Seemuth, Mike (January 18, 2016). "Concrete pours for Brightline facility in West Palm Beach". The Real Deal Miami. Retrieved May 10, 2016. ^ "Schedule". Brightline. 2018. Retrieved January 1, 2019. ^ Broadt, Lisa (2018-06-29). 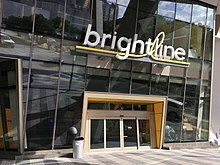 "Brightline financial documents reveal first quarter ridership, revenue". TCPalm. Retrieved 2018-07-06. ^ a b "Brightline Ridership Triples Expectations; Miami To Start By End Of April". The Next Miami. April 13, 2018. ^ "Here's How Many Passengers Have Been Riding Brightline Trains". The Next Miami. April 30, 2018. 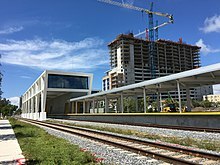 ^ "SOM completes three new Brightline Florida rail stations". Archinect. Retrieved June 10, 2018. ^ "Brightline – Rockwell Group". www.rockwellgroup.com. Retrieved June 10, 2018. ^ Kornfield, Meryl (2018-07-02). "Brightline's garages start charging customers to park". Sun-Sentinel.com. Retrieved 2018-07-06. ^ "Here Are Leasing Plans And New Renderings For All Aboard Florida's MiamiCentral Station Project". The Next Miami. September 22, 2014. Retrieved February 11, 2015. ^ "Fort Lauderdale". gobrightline.com. Retrieved June 10, 2018. ^ Wallman, Brittany (May 4, 2014). "Rail firm appears on track to transform Fort Lauderdale". Sun Sentinel. Retrieved February 11, 2015. ^ Sorentrue, Jennifer (November 11, 2014). "All Aboard Florida updates WPB station design". Palm Beach Post. Retrieved February 11, 2015. ^ Fluker, Anjali (August 11, 2014). "Exclusive: What All Aboard Florida rail station may include at Orlando airport". Orlando Business Journal. Retrieved February 11, 2015. ^ Trejos, Nancy (November 9, 2015). "New Florida train service to whisk passengers between Miami and Orlando". USA Today. ^ "Florida's Brightline to 'take the grey out of travel'". Railway Gazette. November 10, 2015. ^ "All Aboard Florida Selects Siemens as Train Manufacturer" (Press release). All Aboard Florida. September 11, 2014. Retrieved April 8, 2018. ^ Brinkmann, Paul (September 11, 2014). "Siemens to build All Aboard Florida trains". Orlando Sentinel. Retrieved February 11, 2015. ^ Hendrickson, Eric (December 13, 2016). "First Brightline train on FEC rails". Trains Magazine. Retrieved December 16, 2016. ^ Viglucci, Andres (December 14, 2016). "Take a gander at the very first finished Brightline train, now steaming to South Florida". Miami Herald. Retrieved December 16, 2016. ^ "Fifth Trainset Delivered As Brightline Named Official Train Service Of Miami HEAT" (Press release). Brightline. October 5, 2017. Retrieved May 20, 2018 – via PR Newswire. ^ "Brightline train service begins in South Florida". WFTV 9. January 11, 2018. Retrieved February 9, 2018. ^ "Trains". Brightline. Retrieved February 9, 2018. ^ "Brightline going biodiesel". June 5, 2017. Retrieved May 20, 2018. ^ "Charger Diesel-Electric Locomotive: All Aboard Florida" (PDF). Siemens Mobility. 2014. Archived from the original (PDF) on June 23, 2016. Retrieved January 3, 2016. ^ Broadt, Lisa (2018-10-23). "Stuart will pursue Brightline station; city is considering three locations". TCPalm. Retrieved 2018-11-02. ^ Berman, Dave (December 4, 2015). "Brightline rail project moves ahead; Brevard seeks stop". Florida Today. Retrieved May 9, 2016. ^ Neale, Rick (March 10, 2016). "Cocoa eyed for possible All Aboard Florida train station". Florida Today. Retrieved May 9, 2016. ^ Stephens, Henry (2018-02-09). "Brevard backs Brightline, but stresses safety | Melbourne Beachsider | Vero News". Vero News. Retrieved 2018-11-02. ^ "All Aboard Florida ticketing 15 months off". Miami Today. October 13, 2015. Retrieved May 9, 2016. ^ Davis, Ennis (December 23, 2015). "High speed rail project has eye on Jacksonville". Metro Jacksonville. Retrieved May 9, 2016. ^ Kornfield, Meryl (2018-06-25). "Brightline eyes Orlando to Tampa route". Sun-Sentinel.com. Retrieved 2018-07-06. ^ "Orlando-to-Tampa Brightline service could feature a Disney World stop". WESH. 2018-11-29. Retrieved 2018-11-30. ^ "Brightline can negotiate for land on Orlando-to-Tampa train corridor, state says". miamiherald. 2019-11-29. Retrieved 2018-11-30. ^ "Brightline to Build Express Intercity Passenger Rail Connecting Southern California and Las Vegas". Brightline. September 18, 2018. Wikimedia Commons has media related to Virgin Trains USA.